Explores the possibility of Humanity being placed here on Earth by our ancestors who originated from another planet. A Facinating Theory that links together all the other Evolutionary possibilites and arrives at the most probable concept. You will not be ale to put it down ! Challenging religious dogma and common precepts of science, Salvatore Scordato exchanges the mysteries of God for the road of logical conclusions. He imparts that our most wished for dreams and fantasies are nothing more than memories recalled and history repeated. The Exegesis establishes an exciting new theory of our creation. Medieval England, a prince's love is torn apart at the hands of a hired assassin. Four hundred years later his spirit is reincarnated to the body of James Scott who is inspired to create music following a visit from the ghost of his friend who was killed by a mobster. By the grace of a bird spirit he surmounts a tragic childhood of murder and sexual abuse. He meets John Lennon and is compelled to leave home. Starving and alone he encounters a mysterious hermit who guides him towards success. He emerges from the turmoil of addiction, fame and corruption, to be reunited with his love from centuries past, completing the circle. Enter the mean streets of Brooklyn New York where passion and pain erupt into an explosive Rock Opera! Feel the heart pounding rhythms as a poor gang leader and a beautiful rich girl find love in the middle of a neighborhood turff war. Is a Collection of Literary Works from Salvatore Caesar Scordato. It encompasses the best and most successful of his Novels, Poetry and Scripts. You would be hard pressed to find such an exquisite anthology of Dramatic, Romantic, Spiritual and intellectual writings anywhere in the world. If you have been thinking of purchasing a book that will challenge and intrigue you. This is it! These two volumes are both Compiled from Salvatore Caesar Scordato's Early and Recent years of Poetry, Lyrics, Tales and Philosophy. They are wildly enticing with ever expanding Thoughts, Narrations and Expounding Comments that will leave you pondering long after the page has been turned. Added stories of Fact, Fiction and somewhere in between provoke feelings that you once believed were lost. This volume combines Seduction and Redhook into one book. 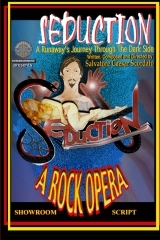 "Seduction" is about a runaway teen seeking stardom. She is led through a maze of deception and manipulations by the Devil and his disciples. Adultery, murder, divorce and scandal follow her until ultimately, "The Rock Opera" ends when she refuses to hand over her first born child to Satan, confirming the tenant, "Good triumphs over Evil". "Redhook", Enter the mean streets of Brooklyn New York where passion and pain erupt into an explosive Rock Opera! Feel the heart pounding rhythms as a poor gang leader and a beautiful rich girl find love in the middle of a neighborhood turf war. Exploits the classic struggle between good and evil by tearing back the curtain to unveil what lurks behind the beautiful and exciting city of Las Vegas. Mary, (a rebellious teenage Singer), has decided to run away from home to find fame and fortune. "The Devil", (disguised as a Music Mogul) dispatches Joe, (a Talent Agent) and Eugene Grant (a Movie Star) with orders to charm Mary into surrendering her immortal soul in exchange for success. Subsequently, "Seduction" leads you through a maze of sexual and mental deception, manipulation, adultery, murder, divorce and scandal. Ultimately, "The Rock Opera" ends happily when Joe realizes that he has fallen deeply in love with Mary and refuses to submit to The Devil, confirming the tenant, "Good triumphs over Evil". During this adventure, Mary encounters a wide-ranging group of captivating characters. Besides Joe the Talent Agent, Eugene Grant the Movie Star and the Motorcycle Riding Prince of Darkness, there is the Cross-Dresser Makeover Artist, an Elvis Impersonator, a Gangster Assassin, Maggie the Whore plus a whole host of Beautiful Female Demons. "Seduction", will tantalize and enthrall you into a frenzy of emotions while at the same time luring you into its beautiful melodies, intricate choreography and heart pounding rhythms. The knowledge amassed within these pages will change your Life. Your perception of what you recognize as reality in this physical world and what you consider imagined in your dreams, will be drastically altered forever. The ability to manipulate your path through life and within your dreams, will take on a new, more certain meaning. You will gain the power to control your destiny and attain every desired goal. 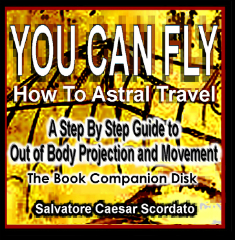 The Music composed on this disk is specifically designed to accompany the book, YOU CAN FLY - How to Astral Travel, a step by step guide to out of body projection and movement. This CD is NOT necessary or essential for the successful completion of the book. A Boy and A Girl fall in love but are separated when the boy is hurt in anaccident and adopted by a lonely Duchess. When The Duchess dies a Winged Horse carries him to The Astral Plane where he is taken care of by a Good Spirit. In order to fulfill the boy's destiny, he is released from the Astral Plane and reborn into the body of an Orphan. The Queen of Huron declares the child legal heir to her Kingdom and when he reaches manhood, becomes King. 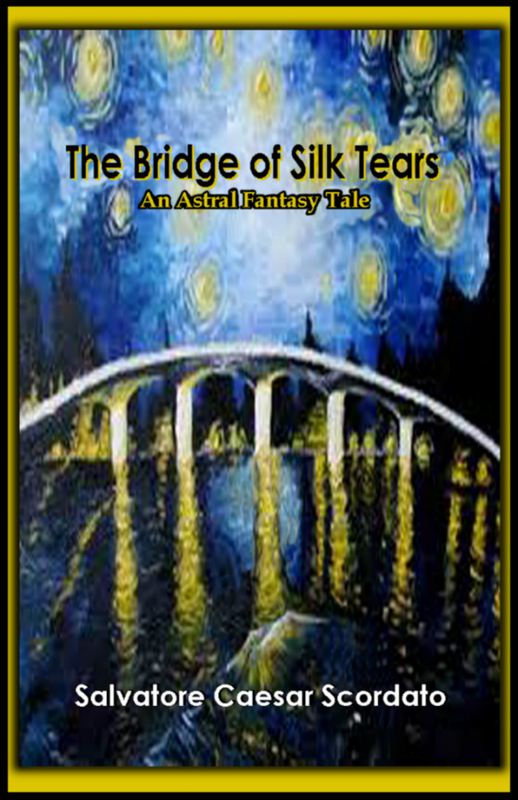 The Good Spirit sends him on a journey across the Bridge of Ages where he meets many amazing and fantastic characters who lead him to The Fountain of Lost Dreams and The Memory Stone that restores his past life memories. Along the way, he meets a Dressmaker who cries silk thread, The Supreme Overseer of the Astral Assembly, The Vision Prophet, The Hermit of the Hills, a Wizard, The Bishop, The Storyteller and a Beautiful Maiden. Eventually he is reunited with his lost childhood love and together they rule the Kingdom as King and Queen. 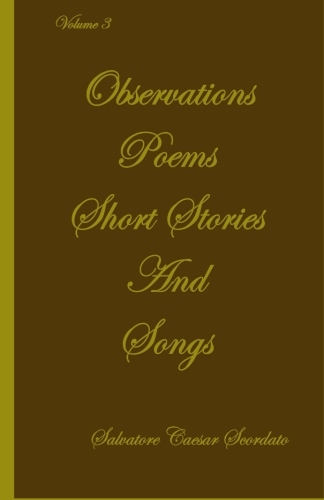 Composed of Salvatore Caesar Scordato's Older and Most Recent Poetry, Lyrics, Tales and Philosophy. The book is Volumes 1, 2 and 3 all combined into one new and complete publication. Included is the newly found Lyrics of his first, Lost and unfinished rock opera, Odyssey 401 circa 1972. The book is wildly enticing with ever expanding Thoughts, Narrations and Expounding Comments that will leave you pondering long after the page has been turned. Added are stories of Fact, Fiction and somewhere in between that provoke feelings that you once believed were lost. 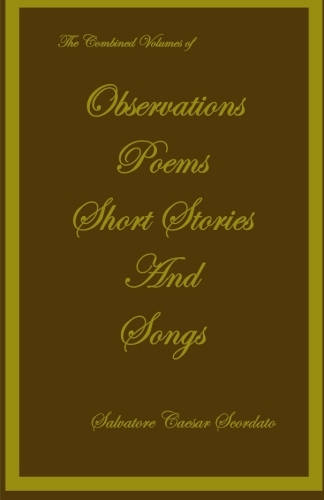 This volume, third in the series, is Composed of Salvatore Caesar Scordato's Newest and Most Recent Poetry, Lyrics, Short Stories and Philosophical Teachings. If you already own Volumes 1 and 2, this is a must inclusion. Contains the extra added Lyrics of his first, Lost and unfinished rock opera, Odyssey 401 circa 1972. 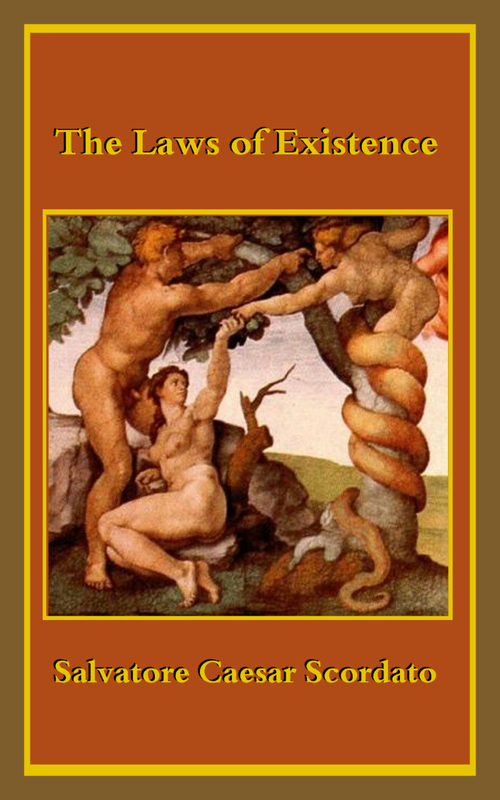 A stand alone enhanced excerpt from my book, "The Exegesis, Who We Are and Where We Come From, These are The Laws and The Lexicon which profoundly explain the fundamental Physical and Moral rules that constitute and govern Humanity and Our Universe. 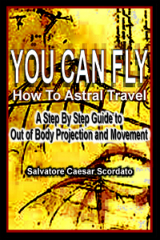 Salvatore Caesar Scordato's Brand New Publication of Poetry and Philosophy. The book is Volume 1 of a completely new composition and is wildly enticing with ever expanding Thoughts, Narrations and Expounding Comments that will leave you pondering long after the page has been turned.